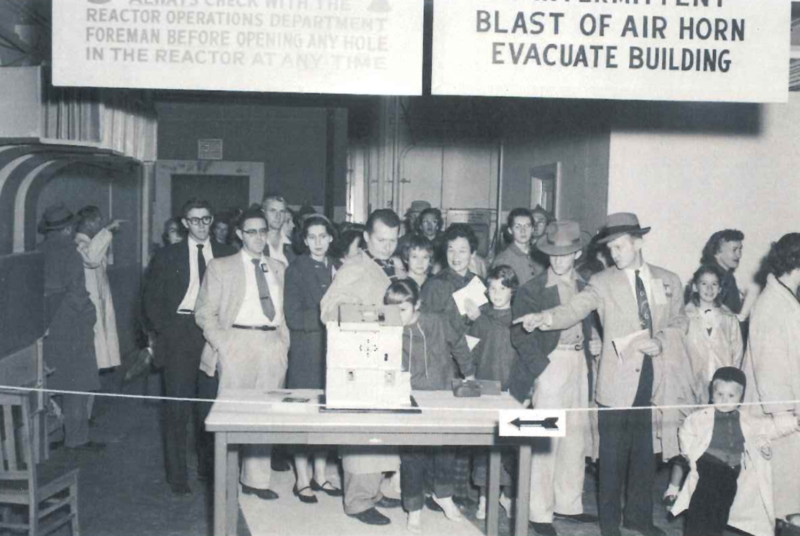 An early open house at Oak Ridge National Laboratory's Graphite Reactor. Some less-often-told tales from ORNL's colorful past. "This wonderful old reactor." Veterans celebrated the Graphite Reactor's 50th anniversary in 1993. Presidential visit, 1992: George H.W. Bush visited ORNL to sign a CRADA. When Tiger Teams prowled: Tom Row spearheaded the controversial ES&H audits at ORNL. First nuclear power: It was generated at ORNL by a toy steam engine. Galvin Commission: Blue-ribbon panel blunted "surplus labs" claim. Lofty ambitions: The Tower Shielding Facility was built for a nuclear airplane that never flew. But science soared. Career opportunities, 1943: George Parker guessed the Manhattan Project secret and became part of it. Famous visitors: ORNL has had its share. White hat guys: Early liquid waste disposal was taken seriously. Amphibian assault: ORNL's famous 'hot' frogs captured the world's attention for a while. Family lines: Multigenerations at ORNL. Graphite Reactor model: History minded staff members rescued it from the dustbin. RIB rescue: Support from the science community, leaders extended Holifield Facility's legacy. Graphite Reactor 75th: Two veterans recalled events leading up to "critical reached!" Check out the history articles in the 75th Anniversary issue of ORNL Review.